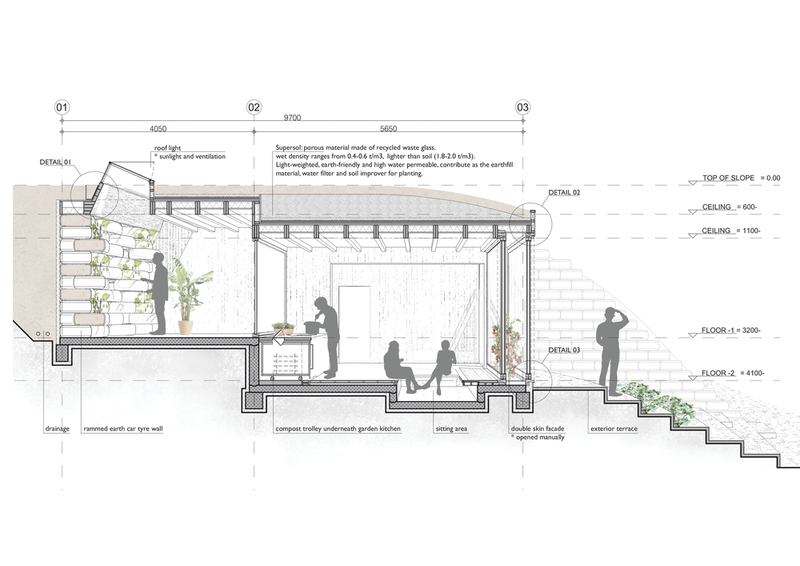 The Kitchen Garden is a design proposal that aims to provide an intense experience of the lifecycle of vegetables and fruits in a sustainable and cost-efficient way. The cycle integrates human activities such as planting, harvesting, preparing food and dining together into a symbiotic and a productive relationship, enabled by the seasons of Taiki-Cho. 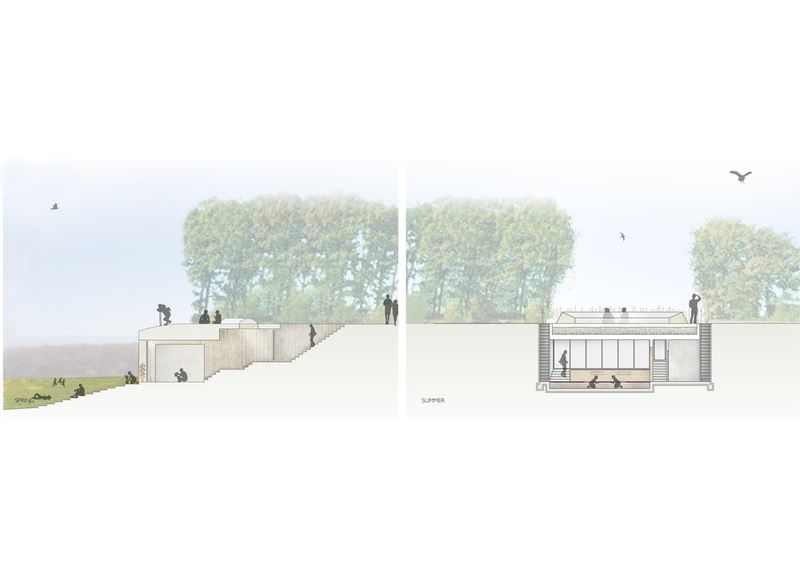 The proposal consists of a land modification of the northern slope; the building connects the upper part of the site with the meadow facing the south, as it offers the best climatic and technological advantages. 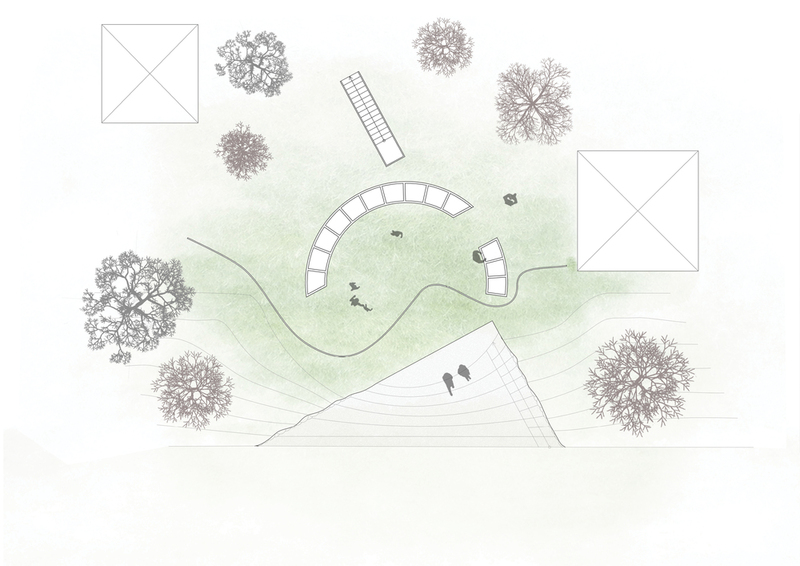 The proposed garden can be experienced as a sequence of three different climates, hot, warm and natural, which contain a unique sensory experience. Each climate zone varies in temperature and light offering the possibility of growing a great diversity of crops all year round, such as, bananas, tomatoes and pumpkin. In order to establish this perennial cycle, the garden and kitchen waste is collected and turned into compost. 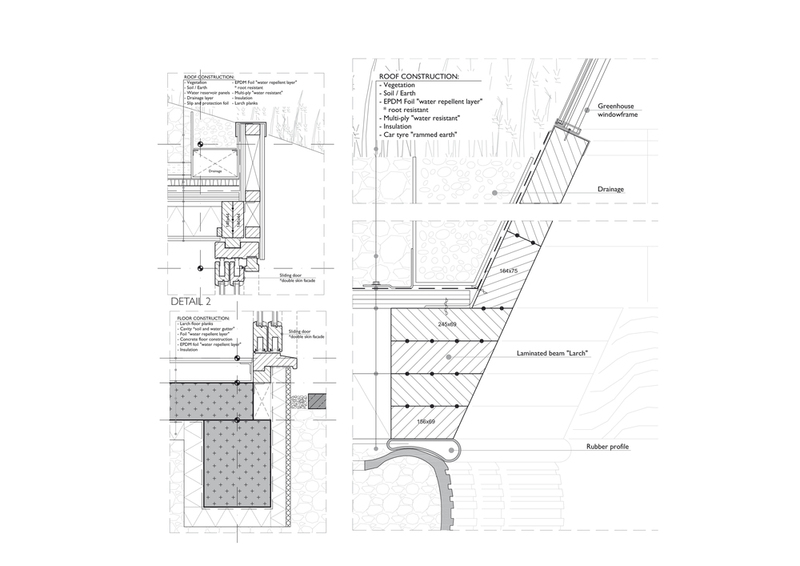 An airtight compartment has been conceived to prevent smell emission from the compost wall. The natural waste from the surrounding, such as leaves, can be gathered and deposited into bins on the roof. The compost is used as the main heat source during winter to establish the needed temperatures in the hot and warm climate zones and thereby reduces heating costs. Later the compost is re-used as a fertilizer for the crops. The chemical process that is induced by the bacteria in the compost will establish a core-temperature from 60 up to 90 °C, the heat will radiate through the floor and simultaneously defrost the exterior stairs in winter. The natural climate zone, the outdoor garden exposes plants that grow in Hokkaido, in a specific moment of the year. The warm climate zone is the main gathering point and therefore needs a comfortable climate all year round. To create this, the green double skin façade provides shading in summer and heating in winter. 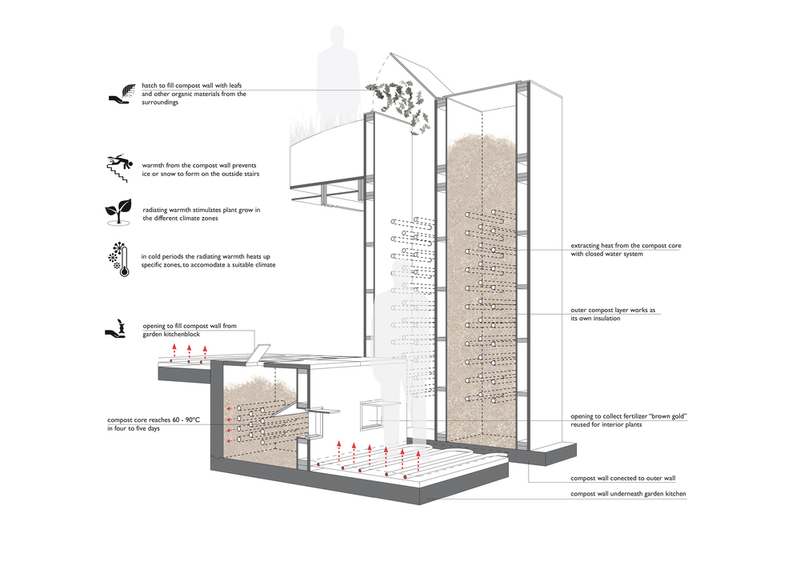 The building is fully inground into the slope to profit from the thermal mass of the soil, which functions as a passive annual heat storage to create a comfortable interior climate in a sustainable way. By constructing the supporting walls from used-car tires containing rammed earth, more thermal capacity is generated saving even more energy. The total thermal capacity will be 18.49 MJ more than when constructed with concrete. 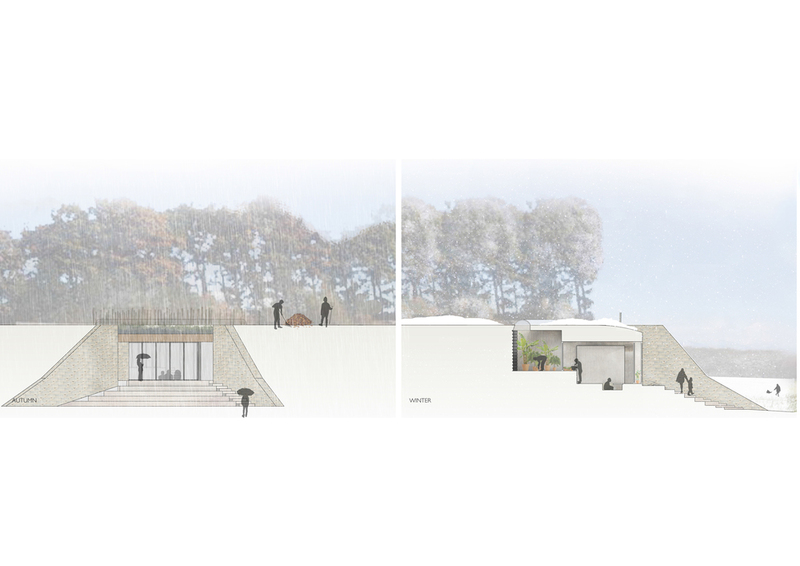 By incorporating and synthesizing the great variety of nature and possible experiences of the area, the “Kitchen garden” could become a unique spot to gather and experience Taiki-Cho with all five senses. The building process starts with excavating the slope at an angle of 45 degrees and other ground works like plumbing, drainage and infrastructure. To create a stable platform for the tyre wall, the initial next phase is to create the constructive flooring and foundation to level out the design. When the base is set, the constructive walls made out of re-used car tyres with rammed earth infill can be erected. 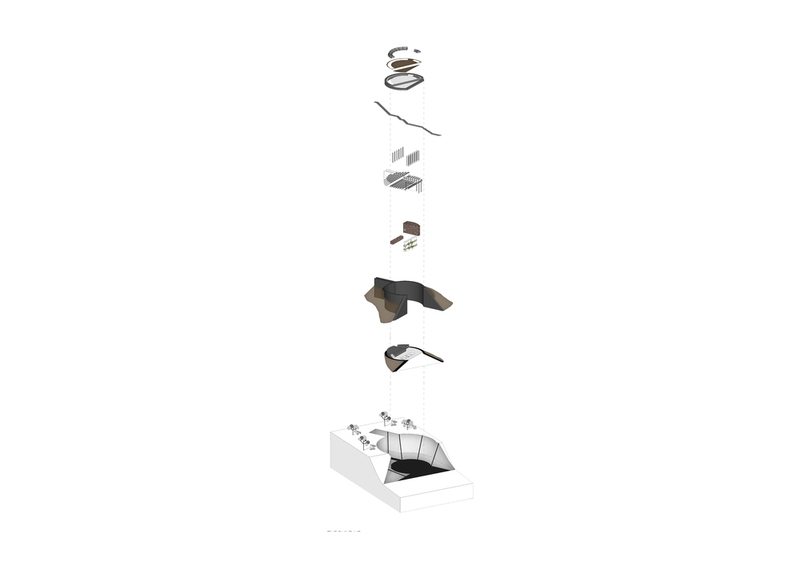 It forms an unified structure with thermal insulation on the exterior combined with a root- and water repellent layer. At this stage the staircase can be constructed internally and the larch roof-beams can be connected to the tyre wall to create a rigid structure. Now the main internal work can start with adding the separation walls and compost wall compartments, simultaneously the staircase and terrace can be built. Before replacing the excavated soil and earth, the roof structure has to be finalized in order to secure overall water tightness. 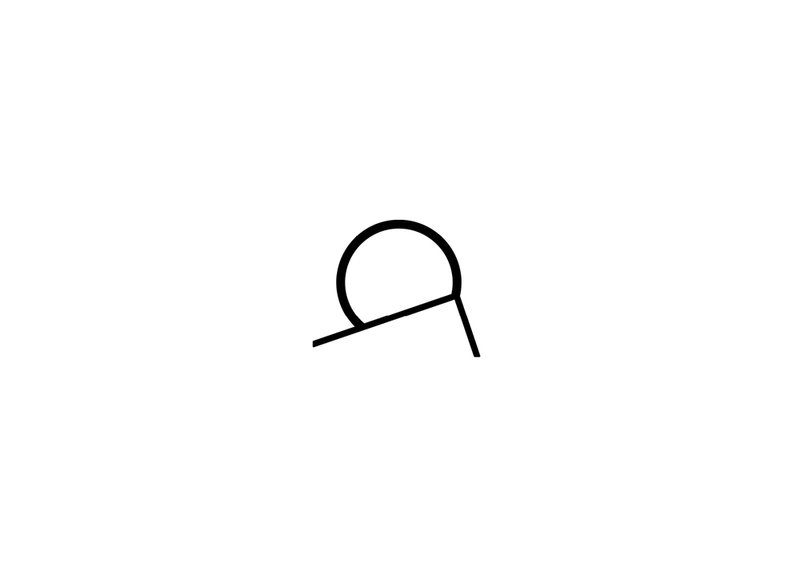 This involves placing the rooflights and connecting the insulating and water repellent layer of the roof with the base. The final step is constructing the vegetation roof and adding the supersol and soil mixture onto it.